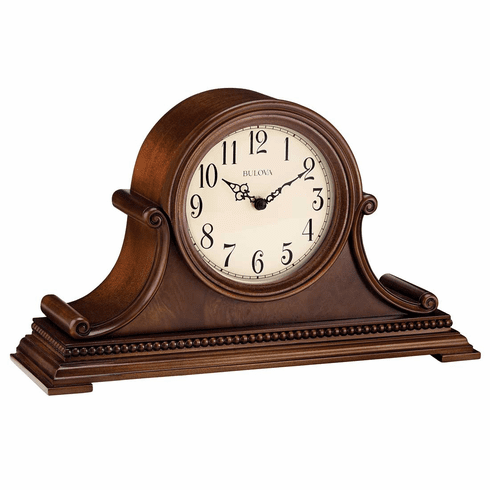 This handsome mantel clock features a bent hardwood case and brown cherry finish. Decorative tambour style with burl accents on front and dentil molding on base. Wooden bezel and full scroll case design with traditional Arabic numerals with metal filigree hands on off-white dial. Bulova Harmonic triple-chime movement plays choice of Westminster, Ave Maria or Bim-Bam melody on the hour. Quarter-hour Westminster chime and strike available. Adjustable volume control. Automatic night shut-off switch available. 1/2" x 3" brushed brass engraving plate included. Requires (1) AA (2) C batteries, not included. Dimensions: H: 8.5", W: 14.5", D: 5.25"